For a unique gift for car lovers, go no further than our double deck of Classic Cars Playing Cars featuring 108 classic cars, images courtesy of Serious Wheels, showcasing some of the most sought after classic cars from various automakers. One entry defines a classic car is, "A motor vehicle, but not a reproduction thereof, manufactured at least 20 years prior to the current year which has been maintained in or restored to a condition which is substantially in conformity with manufacturer specifications and appearance." Definitions vary but according to car afficianados most are rather narrow and limited. Perhaps a more liberal and less restrictive definition of a classic car is a car that no longer depreciates in value and may actually be appreciating based on their value to collectors or groups of admirers. Ford's Model A was the second most successful car after the Model T and was first produced in 1927 and was made available at prices ranging from $385 for a Roadster to $1400 for a top-of-the-line Town Car. The Lamborghini Miura was a sports car produced by Italian automaker Lamborghini between 1966 and 1972. At launch, it was the fastest production road car available. Early Miuras, known as P400s, were powered by a version of the 238 cu in (3.9 L) Lamborghini V12 engine producing 350 hp. The last and most famous Miura, the P400SV featured different cam timing and altered carburetors that gave the engine 380 hp. The gearbox now had its lubrication system separate from the engine allowing for different types of oil to be used. Classic Cars Playing Cards showcases cars from all eras and car manufacturers and is a great gift item for car buffs of all ages. 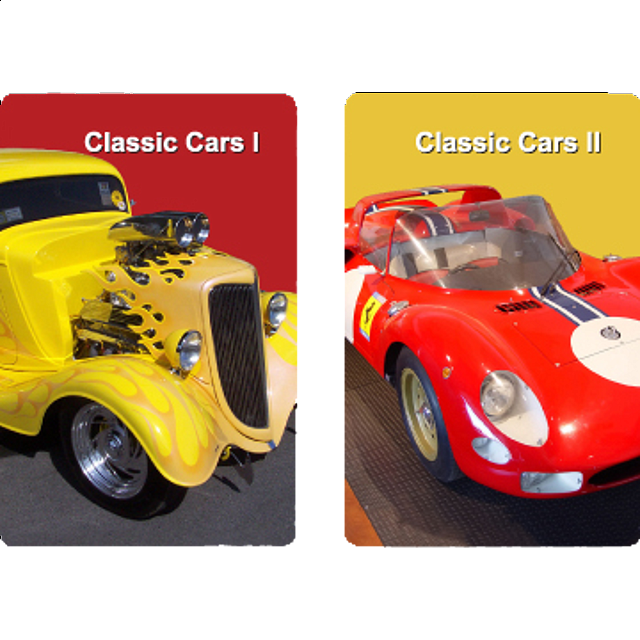 So get out the car remote, rev up your engine and enjoy our visually attractive, one-of-a-kind 108 Classic Cars Playing Cards.